An impact recording device affords you immediate feedback regarding where the club face struck the ball and can help you asses your swing and the proximity of the point of impact to the sweet spot of your club. Why use a ball impact recording device? 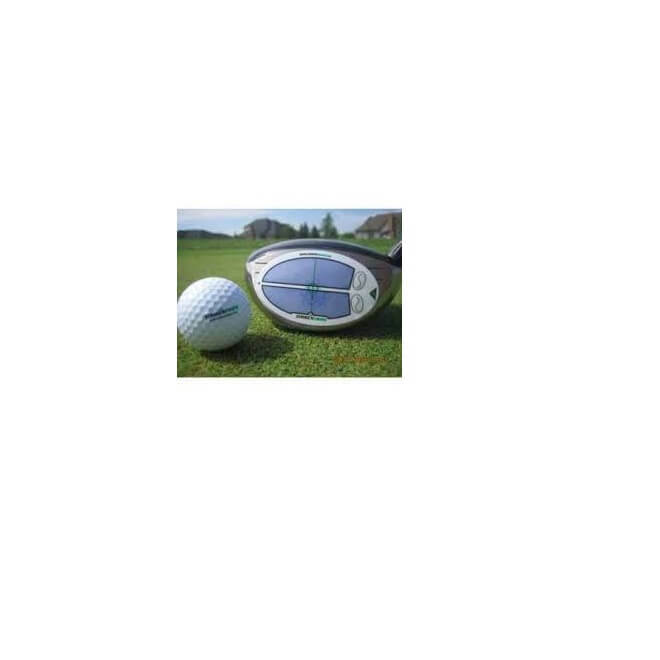 Without a ball impact recording device, the golfer is left with only two sources of information for helping assess the effectiveness of his/her swing, the flight of the ball and the ‘feel’ as it was hit. To these sources on information we add a third, the exact location on the club face where the club struck the ball. An impact recording device affords you immediate feedback regarding where the club face struck the ball and can help you asses your swing and the proximity of the point of impact to the sweet spot of your club. Research shows that the sweet spot of a club is not the same for all golfers. Club speed, back and down swing paths, shaft stiffness, squareness of the club face at impact, club design and other factors differ among golfers and their clubs. As a result, for many golfers, the sweetest spot on the club face may not be at the exact geometric centre of the club. A device that records the point of impact for each swing will go a long way in helping you find your own sweet spot for your own clubs. 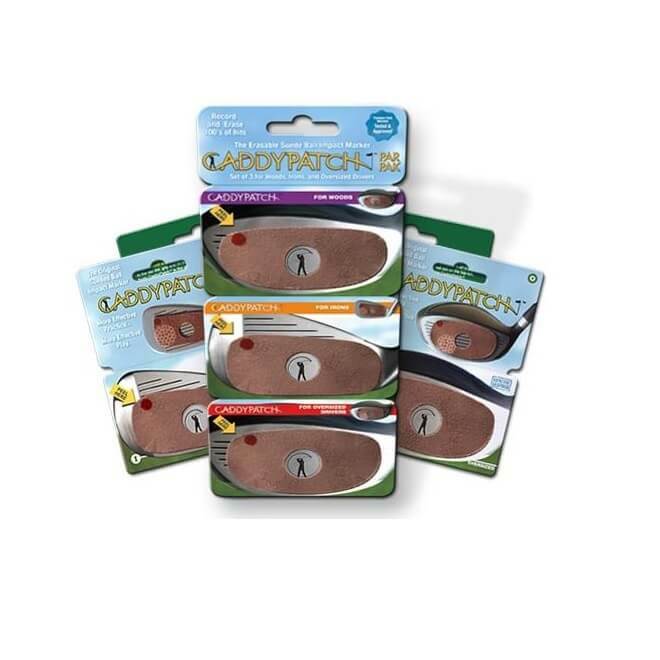 CaddyPatch is designed to make it’s use easy, convenient, discreet and helpful. While some impact recording devices generate dozens of bits of sticky paper or towels full of orange powder, the CaddyPatch generates no waste whatsoever. And the convenience of applying one patch to a club and hitting a hundred times or more before a new patch is necessary is unparalleled. Other products require a new application of spray or sticky paper after each hit or every three or four hits. CaddyPatch will take you through even a large bucket of range balls without removing or reapplying anything. And when you complete your practice session, CaddyPatch is easily restored on the CaddyPatch card for storage in your pocket, wallet or bag. CaddyPatch capitalises on the properties of certain types of sueded or napped leathers that accept and retain an image when applied with pressure. 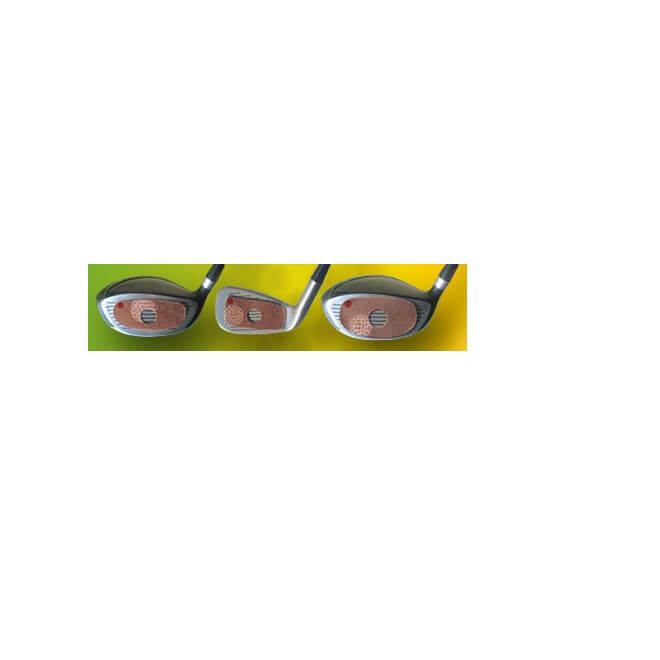 When you apply CaddyPatch to your club face and hit a ball, a vivid image of the ball is captured by CaddyPatch at the point of impact. When you study the image, you will see that even the pattern of dimples on the ball have been recorded. 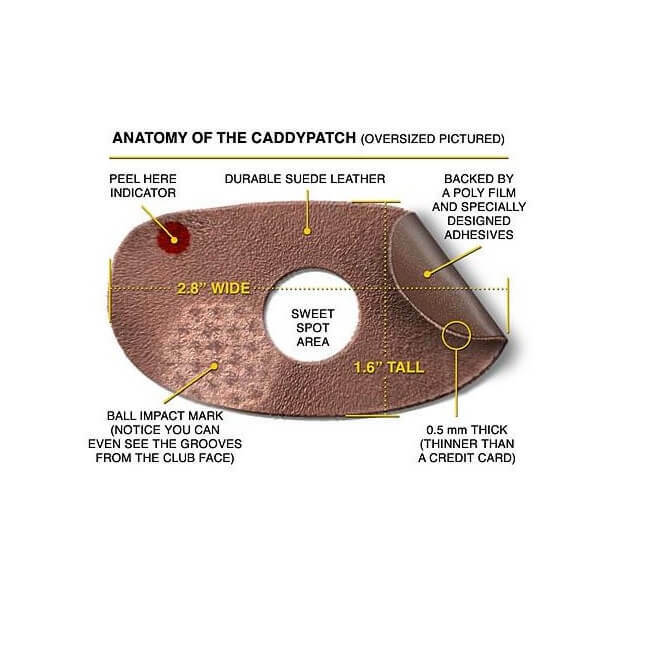 Due to the type of leather used for CaddyPatch, you may also observe the grooves in the face of your club. As a result, CaddyPatch grasps and propels the ball in the same way that the club would have done without it, except now you have a record of where you hit the ball and can match that information with the ball direction, speed and trajectory. Once you have studied the point of impact, use your thumb to lightly brush away the image of the ball. It takes only the smallest pressure to erase the image and return your CaddyPatch to it’s unmarked state. Having erased the image, tee up another ball. Each image is captured and erased individually. There is never any confusion or uncertainty about where you club face struck the ball.